Robert Mugabe has done it again. This tyrannical leader known for his abuses and excesses while ruling the impoverished nation of Zimbabwe chose to celebrate his 91st birthday by serving an elephant calf as dish in his celebratory feast. According to Daniel Stiles, an animal conservationist who has investigated the poaching of elephants over the past 15 years, elephant is not a part of the culinary tradition in southern or eastern Africa. There is no cultural basis for the consumption of elephant meat by Mugabe and most of the world at large. Today, there are about half as many wild elephants in the world than there were in 1980, down from about 1.2 million to around 600,000. These amazing animals are cornerstone animals to their ecosystems and habitats. They also generate many more thousands of dollars in tourism than their meat alone could ever provide. According to Resson Kantai Duff, acting head of awareness for the conservation group Save the Elephants, even the death of one elephant is "taking away from [the community's] ability to earn money." Robert Mugabe's many crimes against the people and land of Zimbabwe prove that he doesn't care what people think of him. Ask United Nations Secretary-General to condemn the consumption of elephant meat as being incompatible with the U.N.'s mission to recognize the intrinsic value of wildlife. I am horrified to learn that for his 91st birthday, Prime Minister Robert Mugabe chose to serve his guests elephant meat as a dish in his celebratory feast. Since 1980, the number of wild elephants in the world has been cut in half, down from about 1.2 million to around 600,000. These amazing animals are cornerstone animals to their ecosystems and habitats. They also generate many more thousands of dollars in tourism than their meat alone could ever provide. According to Resson Kantai Duff, acting head of awareness for the conservation group Save the Elephants, even the death of one elephant is "taking away from [the community's] ability to earn money." Daniel Stiles, an animal conservationist who has investigated the poaching of elephants over the past 15 years, has said that elephant is not a part of the culinary tradition in southern or eastern Africa. There is no cultural basis for the consumption of elephant meat by Mugabe and most of the world at large. Mr. Secretary, please speak out and condemn the consumption of elephant meat by Mugabe and those like him who would seek to destroy the natural heritage of Africa by turning the endangered elephant into a culinary delicacy. Elephants are not food. Eating them cannot become acceptable or fashionable. This incredible animal is depending on you. 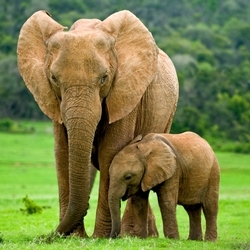 Please speak out on behalf of elephants. That's 47,892 signatures! Let's keep the ball rolling.